Necessity was the mother of invention for Maura Horton when she came up with the idea for MagnaReady®. Maura was inspired when her husband, a college football coach, had to rely on a player for help when the effects of Parkinson’s Disease prevented him from buttoning his shirt. Determined to help her husband remain independent, Maura came up with the idea of a magnetically infused shirt that did not require finger dexterity to wear. MagnaReady® is the original magnetic shirt company. I have to be honest, I've never heard of apparel that uses magnets as closures. I was definitely interested in seeing how it worked. I chose a black polo shirt in size XL and a dress shirt in size XXL for Jason. Upon first looking at them, they didn't seem to be much different than other shirts he owns. But, upon further inspection, we saw what made this apparel incredible - the magnetic infused closures! 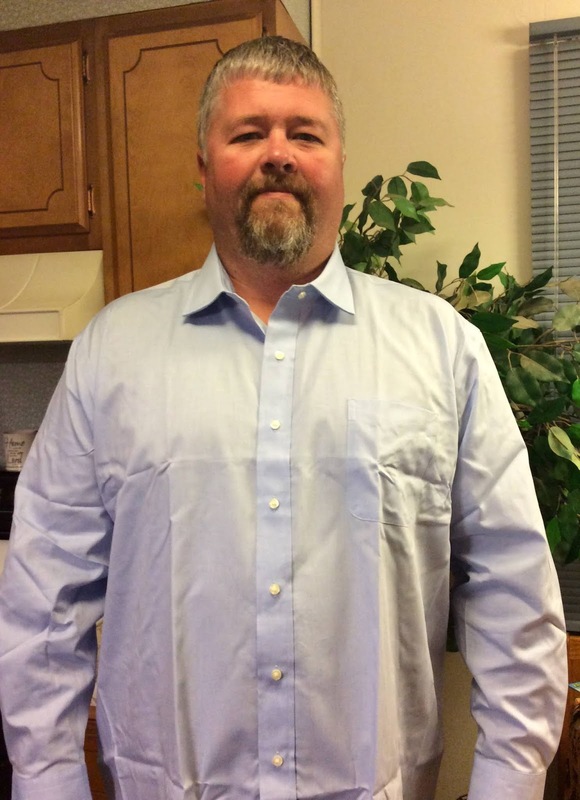 MagnaReady® shirts simplify the dressing process by eliminating the need to maneuver buttons through button holes. 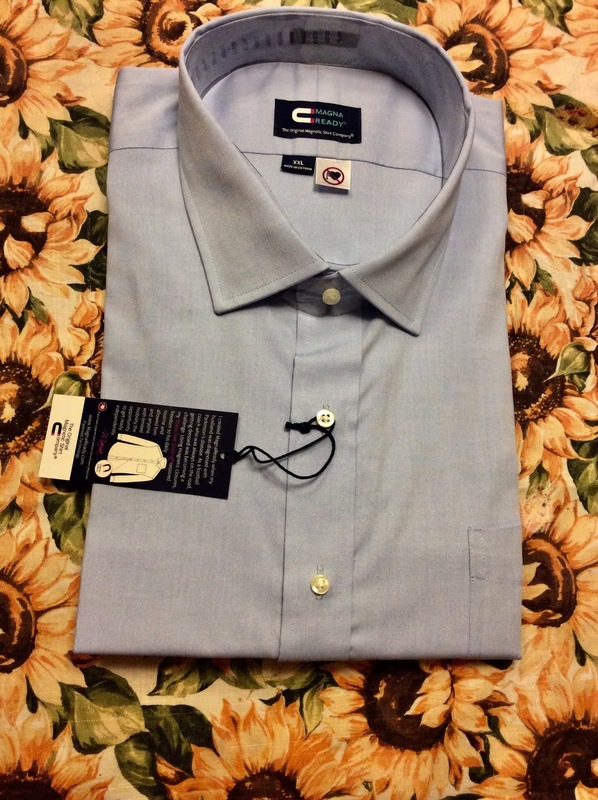 A patented magnetic closure system securely holds the shirt front closed. “Buttoning” up only requires overlapping the two sides of the shirt front and the magnets click together. In other words, it's super easy to put the shirts on and take them off. The blue long sleeve dress shirt was neatly folded when received. I did have to wash and dry it before being worn because it was wrinkly once I unfolded it. After the first wear, Jason hasn't had any problems with wrinkles. The MagnaReady Birdseye Polo is crafted for a luxurious feel using a blended weave of Pima Cotton and Micro Polyester. Two decorative buttons are sewn at the neck on the shirt placket for a traditional polo aesthetic. The polo is cut for a classic fit, and is available in two colors. Jason doesn't really have a need for adaptive fashion at this time (or maybe ever) but we were still impressed with the long sleeve shirt and the polo. Jason was a little apprehensive at first, wondering if the magnetic closures would stay close the entire time wearing them. If you pull on the front of the shirts like The Hulk, they're going to easily open. But, if you leave them alone and wear them like they should be, the shirts will not "unbutton". Both shirts have a classic look and fit well. Jason's been wearing them when working during church or while doing hospital ministry. Don't pay attention to the chest hair on the left. Divert your eyes to the right, where you'll see the square markings. That's where the magnetic button closures are located. Do you know someone with a need for adaptive fashion? Have you heard of MagnaReady? I like the black shirt. I've never heard of this brand, but I do like the magnetic buttons. That is really cool. I think my husband would like to try a shirt out. I love seeing inventions like this that help people with mobility issues. The shirts look comfy and stylish.